As part of the publicity surrounding the relaunch of AshTag today, Sylva Foundation chief executive Gabriel Hemery was interviewed by Paul Hawkins for the BBC World Service. The Living Ash Project is hoping that many more volunteers will help find ash trees that show some tolerance to the dieback fungus. So far one tree — nicknamed ‘Betty’— has been found by another group conducting genetic studies. We need to find at least 100 more trees that show some tolerance to ash dieback, and that’s where you can help! With kind permission of the BBC, you can listen the full version of the interview using the link below. Find out more about how you can help secure a healthy future for ash in Britain. Visit the Living Ash Project website and request a free ashtag. 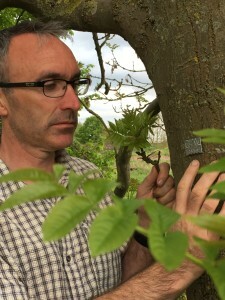 The Living Ash Project is a Defra-funded consortium comprising representatives from Earth Trust, Future Trees Trust, Sylva Foundation and Forest Research. It aims to identify a large and diverse number of ash trees with good tolerance to Chalara ash dieback, to secure this material for further breeding work, and to quickly make this material available to industry. We are indebted to volunteers of the Earth Trust in preparing the AshTag packs.